Have a number of favorite DVDs that you want to enjoy on your sharp and big Samsung TV, but no DVD player? No worries as there are a number of ways through which you can enjoy your discs without having a DVD player. Know the best ways on how to play DVD on Samsung TV in the following part of the article. One of the best and the most straightforward ways to play your DVDs on a Samsung TV is to stream your disc from PC to your Samsung TV. 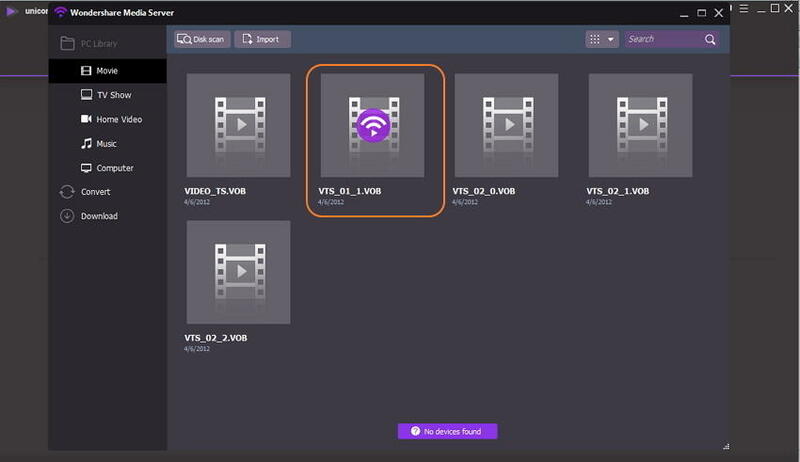 In order to stream your DVD, good professional software is needed, and Wondershare UniConverter (originally Wondershare Video Converter Ultimate) is the best for this. 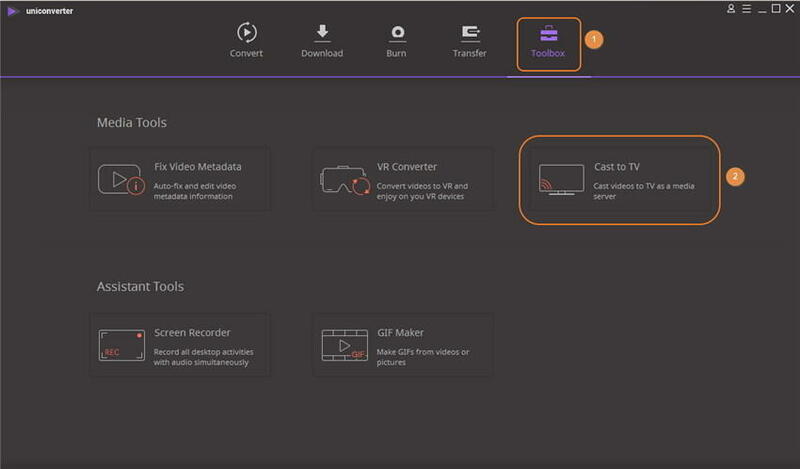 This complete video toolbox has a feature which allows you to cast videos to your TV. A number of formats are supported by the software for streaming videos like AVI, MKV, VOB, MPG, FLAC, MTS, and others. Cast DVD video to TV, Samsung TV included. Burn videos to DVD folder/ISO/DVD disc. 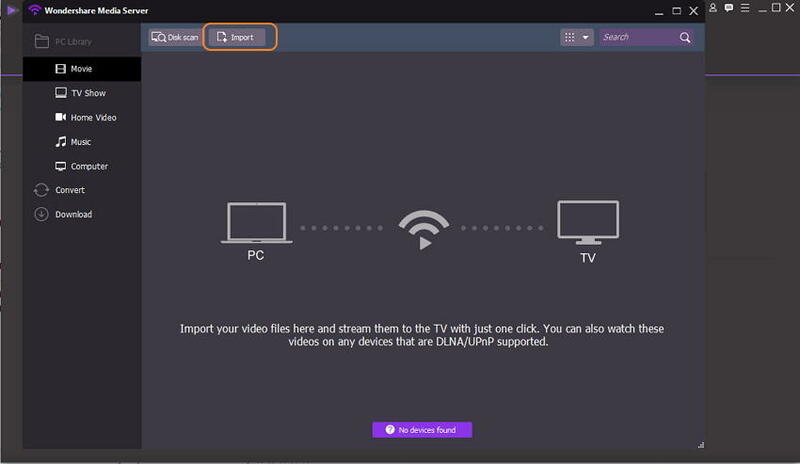 Before proceeding with the following steps, insert the disc that you want to play in your PC and connect your Samsung TV to same network as your PC. Step 1 Launch UniConverter (originally Wondershare Video Converter Ultimate) and open Media Server. Download, install, and launch Wondershare Software on your PC. 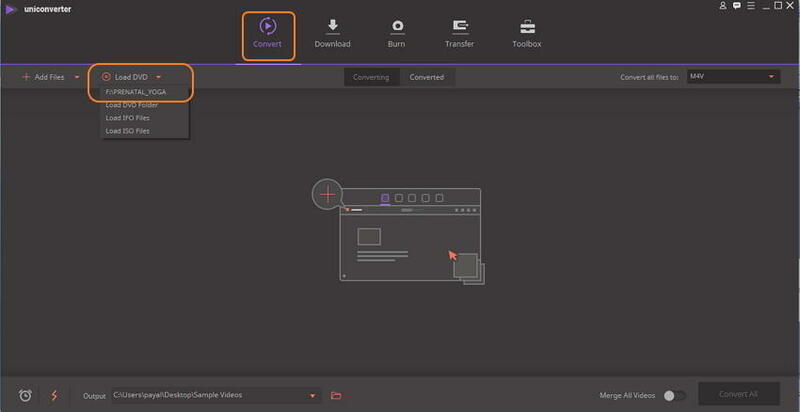 From the main interface, select the Toolbox tab, that will open Media Tools category. Click on the Cast to TV option and a new Media Server window will open. Step 2 Connect Samsung TV to PC. The new window will show all the videos available on your computer under PC library. Click the Import button to add the video from your inserted disc to the library. Step 3 Play Video on Samsung TV. Hover the mouse over the video that you want to play on your TV, and a WiFi like icon will appear on it. Click on the icon, and the video will start casting on your TV as well. The present day high end TV sets like Samsung allows connecting a number of peripheral devices to play your desired movies, and other content. So if you have your titles on disc that you want to play on your TV set without DVD player, USB drive is a great option. You can rip your DVDs and put it on a USB drive and for this a good ripping program will be needed. Wondershare UniConverter (originally Wondershare Video Converter Ultimate) here again proves to be an excellent choice as it facilitates ripping your disc content to MP4 and other formats which are supported by Samsung TV. The process of DVD ripping using the tool is fast and ensures lossless quality conversion. Step 1 Open DVD ripping program and load disc files. Launch UniConverter (originally Wondershare Video Converter Ultimate) on your computer and insert DVD into your disc drive. If external drive is used, connect the same to your system. From the software interface, select the Convert tab and click Load DVD option. A new DVD Load Model window will open and ask you to add Main Movies or All Movies. Select as desired and click OK. Step 2 Select output format supported by Samsung TV. The added movies will appear on the program interface as thumbnails with details. Next, click drop down icon next to Convert all files to: option and select MP4 from the Video tab or Samsung TV from TV > Device tab. Here you can also select the desired resolution of the output file or keep it as original one. Step 3 Convert DVD videos and add to Transfer list. Click Convert All button to start the process of converting DVD movies to MP4 format. The converted files will appear under the Converted tab. Select these converted videos and click Add to Transfer option. You can also right click the files and select Add to Transfer List. Step 4 Transfer MP4 videos to USB drive. Open the Transfer tab on the software interface and connect the USB drive to your PC. The drop down menu at the top-right corner will show the connected devices. Choose USB from the list. Next, select the converted DVD movies and click Transfer All. The DVD files that are converted to MP4 format will be successfully transferred to USB drive that you can connect and enjoy playing on your Samsung TV.